Chinchillas come in a wide variety of colors, or mutations as they are called. There are presently more than 30 different chinchilla colors! Let’s take a look at the most common ones. In the wild, there are three species of chinchillas: Chinchilla chinchilla, Chinchilla Costina, and Chinchilla lanigera. 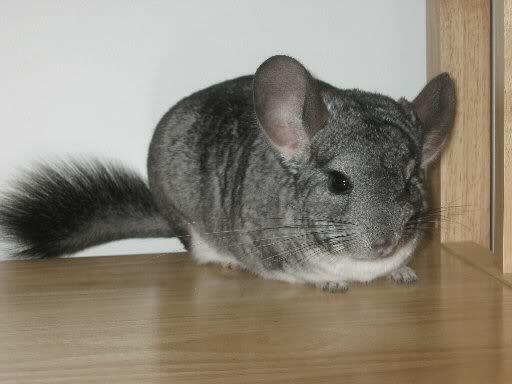 Pet chins were originally bred from Chinchilla lanigera, producing Standard Gray chinchillas, the original mutation which all other color mutations derive from. By combining individuals with specific characteristics, breeders later managed to produce different color mutations. These mutations have then been crossbred to create even more variations. And that’s why the number of colors are continuously increasing. Standard Gray is the natural color mutation of wild chinchillas. The coat is light to dark gray, and the belly is crisp white. Some individuals can have a blueish hue to their coat. Standard Grays are the “raw material”, so to speak, for producing all the other color mutations. They are also the cheapest to buy. Hetero Ebony. Black and dark grey coat, with a light-gray belly. Homo Ebony (or Extra Dark Ebony). Shiny black coat, with no other colors present. Even the eyes are black. Hetero Ebony. Image: Sunset Chinchillas. White chins have white coat, and black or ruby eyes. There are multiple variations of White – White Mosaic, Pink White, Wilson White, Silver, White Tan, White Violet, and more. Heterozygous Beige chins are light beige on the sides, and dark-beige along the spine. A white belly, and pink nose and feet, are other characteristics. The ears are pink and often freckled. Homo Beige chins have red eyes, and a lighter coat than the Hetero Beige. But apart from that, the two mutations are similar. Pink feet, ears, and nose. White belly. First appearing in Rhodesia, Africa, in the 1960s, violet chins have a gray coat with a purple hue. They have a white belly, black eyes, and pink-gray ears. Somewhat similar to the Violet, Sapphire chins have a white belly, dark eyes, and a light-gray coat with a blueish hue. Some people say that Sapphires are the hardest to breed and take care of. Black Velvets are mostly black, but gray on the sides, with a crisp white belly. The eyes and ears are dark, and the paws have dark stripes. Starting with the Standard Gray, an ever expanding number of color mutations have been produced. If you’re interested, here’s a list of 31. How Many Babies Do Chinchillas Have?